The report provides forecast and analysis of the global corrugated packaging Market. It provides historical data of 2012-2016 along with forecast from 2018 to 2026 in terms of revenue (US$ Mn) and volume (000’ Tonnes). It includes drivers and restraints of the Global Corrugated Packaging Market and their impact on each country during the forecast period. The report also comprises of the study of current issues with end users and opportunities for corrugated packaging manufacturers. It also includes detailed pricing analysis by product type and value chain analysis. A number of primary and secondary sources were consulted during the course of the study. Secondary sources include Factiva, World Bank, Packaging Digest, and Hoover’s, and company annual reports and publications. Market numbers have been estimated based on average usage of corrugated packaging on the basis of applications and the revenue is derived through cost of corrugated packaging in tonnes. Market size and forecast for each segment has been provided in the context of global markets. The corrugated packaging has been analyzed based on expected demand. Prices considered for the calculation of revenue are average regional prices obtained through primary quotes from numerous regional packaging manufacturers, suppliers, and distributors. All key end users have been considered and potential applications have been estimated on the basis of secondary sources and feedback from primary respondents. Regional demand patterns have been considered while estimating the market for various end users of corrugated packaging across the globe. Top-down approach has been used to estimate the corrugated packaging by region. Global market numbers product type, packaging type and end use have been derived using the bottom-up approach, which is cumulative of each regional demand. Company-level market share has been derived on the basis of revenues reported by key manufacturers. The market has been forecast based on constant currency rates. 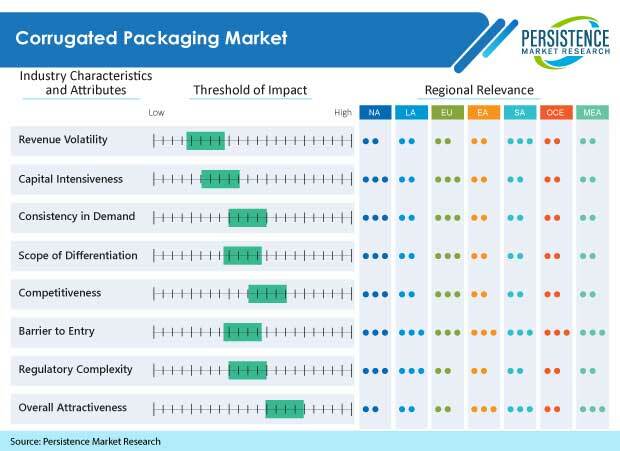 Some of the key players in the global corrugated packaging market have been profiled thoroughly in the PMR’s report, including Rengo Co., Ltd, Saica Group, Oji Holdings Corporation, Packaging Corporation of America, DS Smith Packaging Limited, Mondi Group, Georgia-Pacific LLC, Smurfit Kappa Group PLC, Westrock Company, Pratt Industries Inc. , Menasha Corporation, Cascades Incorporated and among others. Corrugated packaging market includes secondary shipping corrugated boxes, primary corrugated boxes, and corrugated retail display stands, which are used for packing non-durable goods, durable goods, food and beverages, and non-food and non-manufacturing items (in wholesale trade and retail trade services). The global corrugated packaging market has been estimated to be valued around at US$ 168.09 Bn by 2018 end, which is presumed to expand promisingly over the projection period 2018-2026, at 5.8% CAGR. On the basis of application, corrugated packaging will continue to gain traction in food & beverages, electrical & electronics, home care products, personal care products, Ecommerce, transportation & logistics, healthcare, and other sectors. While the food and beverages sector is expected to be the largest consumer of corrugated packaging throughout the forecast period, Ecommerce has been recognized as the most opportunistic application area for stakeholders in the corrugated packaging industry. The electrical and electronics end use segment is expected to witness a considerable growth in the forecast period, owing to the increasing shipments of consumer electronics products, including tablet, smartphone, laptop, and flat screen television, especially in the emerging Asian markets. Increasing preference for economical, eco-friendly, and light weight packaging by end-users such as electronics, automotive, pharmaceuticals, healthcare, and food and beverages sectors, will remain a major factor driving the growth of corrugated packaging market through 2026. The flourishing Ecommerce sector is anticipated to play a pivotal role in escalating adoption of corrugated packaging. Furthermore, corrugated board is an eco-friendly packaging material, comprised of recyclable materials like used cardboard carton and old newspapers. Moreover, corrugated cardboard is often produced without the use of dyes or bleaches, thereby reducing its footprint and level of recyclability. As indicated by regional analysis of global market for corrugated packaging, APAC is estimated to account for the highest revenue share, followed by North America. Over the past few decades, Asia Pacific has been the largest producer as well as consumer of corrugated packaging, which is believed to continue over the forecast period. Booming sales of processed foods and beverages especially in developing countries, including India, China, Malaysia and Indonesia, account for robust growth of APAC market. In addition, bolstering expansion of the Ecommerce business within emerging Asian economies is expected to elevate the demand for corrugated packaging demand through the projection period. As far as developed markets are concerned, increasingly strict regulations regarding non-biodegradable materials will continue to drive markets in North America and Europe in upcoming years. As per the segmental insights resulted from research, single wall board will reportedly take over single face board, and double and triple wall board in terms of materials; whereas boxes are anticipated to lead by packaging type, with more than 80% share of the total market revenue in near future. Other types of packaging include trays, crates, pallets, and octabins.